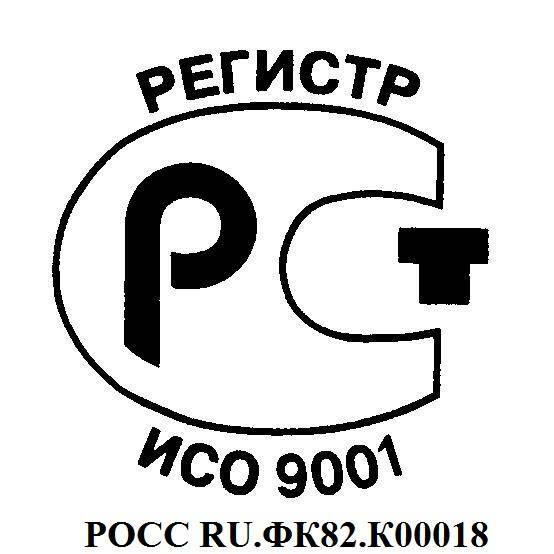 Кантователь цепной КНЦ-4000[/caption]e-1047″ />Limited liability company KTIAM has an extensive experience in designing and manufacturing of technological equipment for automation and mechanization of production processes. 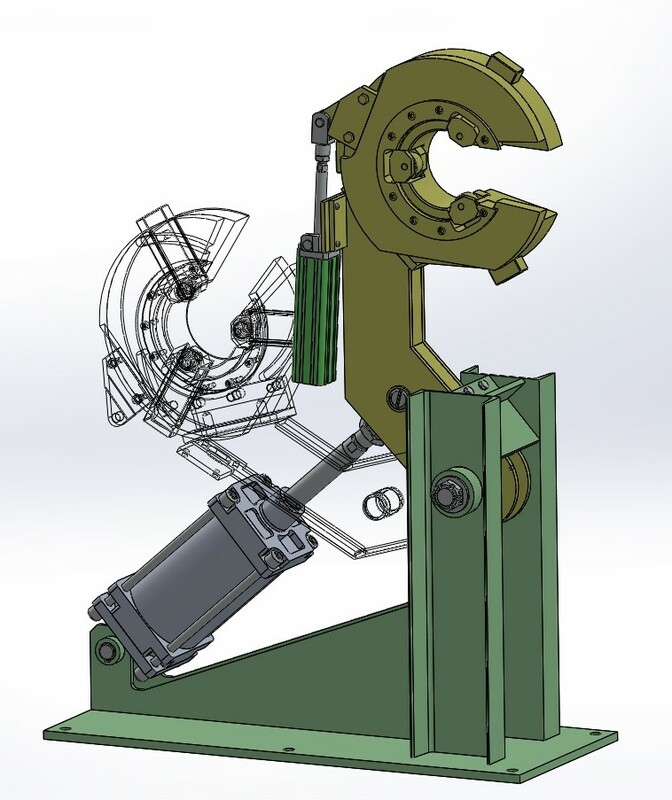 Hydraulic clamps are designed to capture and hold products or work-pieces for technological operations that require a lot of effort in processing (Up to 1500 кN). 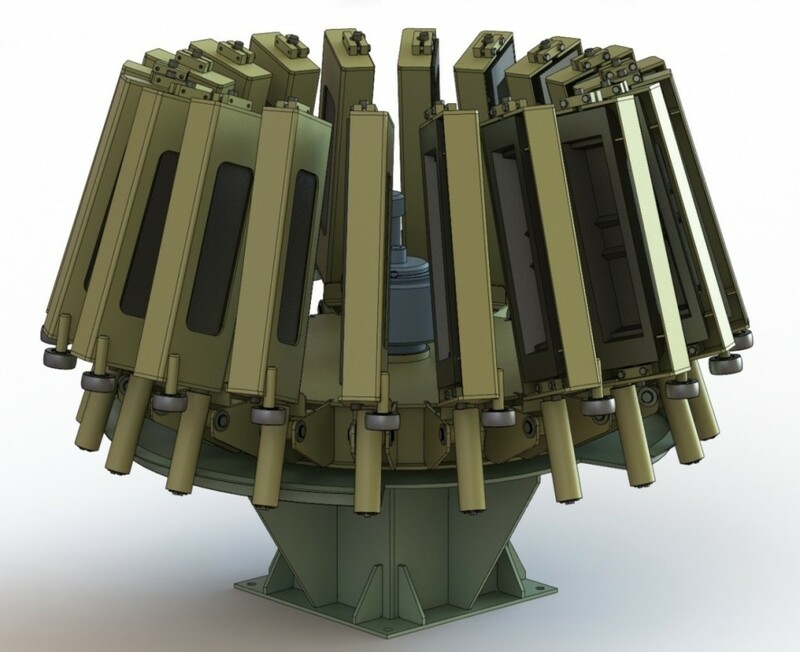 It can be made as a collet with an axial load or an open top-loading. The main elements of the clamp are – the clamping jaw (1), body (2) and rails (3). This clamp prevents the axial displacement of the work-piece, providing a high quality finished product. Automatic mobile and immobile drive lunettes. Lunnets are used in the processing of long work-pieces of circular cross section ( with a diameter up to 500 mm) on machines with computerized control and on the other technological equipment. Lunettes are driven and led to clamp work-piece by pneumatic or hydraulic cylinders with a special valve to adjust the clamping pressure. 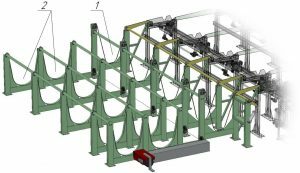 Chain tilters are designed to rotate work-pieces of rectangular, square or circular cross-section (beams, pipes, columns, metal etc.) 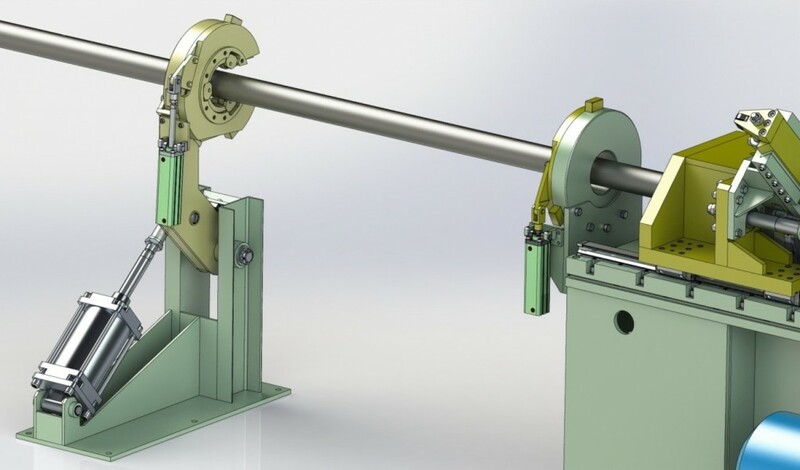 in a position that is convenient to perform welding, assembly and other work that requires the piece’s rotation around the horizontal axis to any angle. It also allows piece’s lowering and uplifting. The line with carrying capacity of 4 to 25 tones is developed by the workforce of KTIAM. 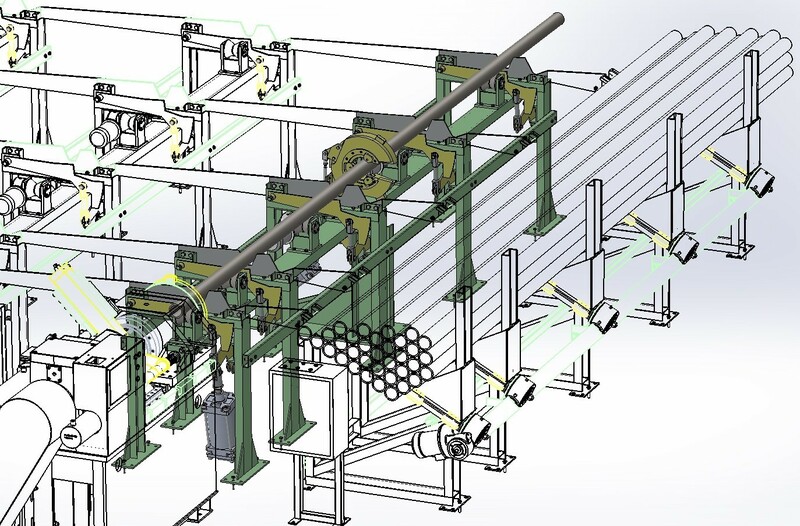 Elements of production lines are designed for automatic movement and positioning of the work-piece between the production steps. The weight of work-piece can reach 5 tons and the length can reach 16 meters. intermediate storage pocket with soft batching and other accessories. The mechanism for loading and unloading of work-pieces. Mechanism has a certain load capacity. 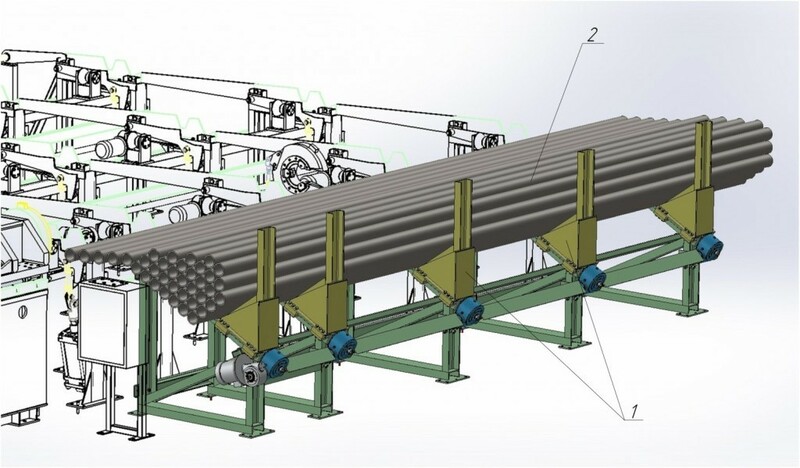 The use of pusher (1) allows for smooth flow of the pipe or other work-pieces (2) to the subsequent process step. It eliminates constant monitoring of the process by employees, thereby reducing labor costs and increasing efficiency. Mechanism for loading and unloading of the work-pieces. Mechanism for bi-axial movement of work-pieces. 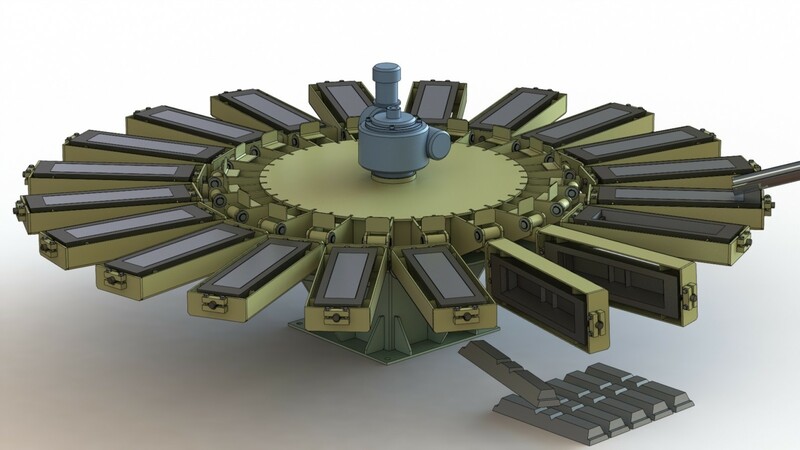 This Mechanism is used for an axial serving of the work-pieces for the processing, and its subsequent move to the next step of the technological process without participation of human. In case of long work-piece the mechanism can be stuffed with an automatic folding lunette. Storage with a pocket for soft batching. Intended for storing finished products with the aim of further packaging and warehousing. The storage includes mechanism for a soft batching of work-pieces (1) to reduce the deformation of the product from a hit during the formation of the batch, as well as two “pockets” (2) for the preparation of batch for packaging. Intermediate storage with a pocket for soft batching. 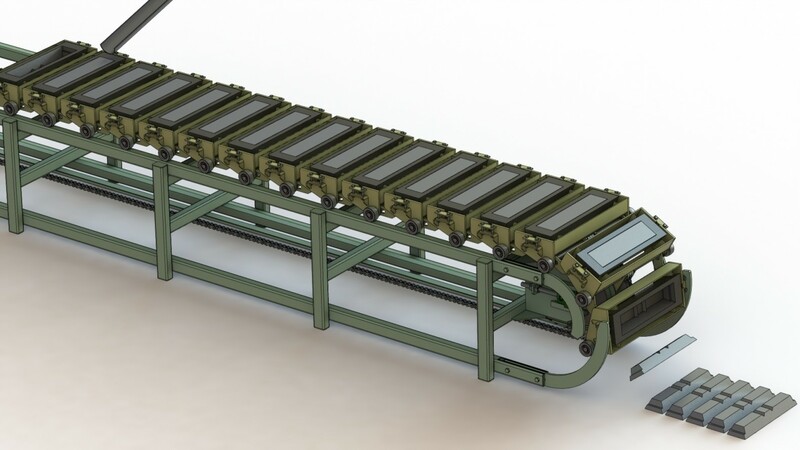 KTIAM LLC has experience in designing and manufacturing of mechanized casting conveyors and carriers with capacities from 0.5 to 35 tons per hour, designed to improve the productivity and quality of foundries. 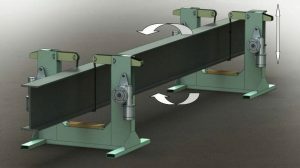 It is possible to assemble conveyor of both linear and rotary type with cooling and without it. We are also ready to completely automate the entire process of metal casting. Conveyor of rotary type ККТ-9S.